In this November 2, 1962, discussion, Kennedy explains why he doesn’t want the issue of the secret negotiations in New York to remove the IL-28 long-range bombers to be discussed in public yet. The administration was facing pressure to release more surveillance photos amidst a general clamor for information. But Kennedy was reluctant to discuss the IL-28s until it became clearer what the outcome of the negotiations might be. Robert McNamara I just have this question of the IL-28. We’re being put under tremendous pressure by the press to talk about the IL-28s. And I haven’t admitted yet, but we flew up right against the airfield yesterday, but I’m not sure how long we can sit on this information. John McCone I'm--I feel much the same way. I’m very much afraid that if we release the missiles without the IL-28s, having the IL-28s, it might leak out to people [unclear] bad repercussion. JFK I think you don’t— it seems to me that the thing that has dominated— in the first place, we don’t know whether we’re going to get the IL-28s out of there. But the thing that has dominated is the missiles. If we can show progress on the missiles, I don’t think we have to release every one of our pictures. I think . . . we don’t know what is going to happen to the IL-28s. Therefore for very good national reasons, we don’t want to get into that subject publicly, yet, with them, do we? JFK Well, I think the missiles alone, therefore . . . we made a statement. The only statement after all that the defense department made this morning was dealing with missiles. JFK We could show the evidence for that statement, then just say, “As these negotiations go on we may have other . . . .” Try to just keep people [unclear]. 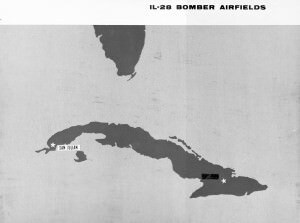 McNamara If we can just say, have [Pentagon spokesman Arthur] Sylvester say, he has no information on the IL-28s. Drop it at that. That’s what I told him to say. Rusk We can handle that. Excerpted from a transcript to be published in David Coleman, ed., The Presidential Recordings: John F. Kennedy vol. 4 (New York: W.W. Norton, forthcoming 2013).